At Common Hour this past Thursday, Professor Cathy Drennan, shared her research on the future of the classroom. Drennan first began to notice, as a high school chemistry teacher, that some studies don’t always see the value of learning chemistry in relation to real-world problems and how they also do not see themselves as future chemists. Drennan wanted to engage her students and wanted them to feel inspired when coming to class as well as improve their confidence within this field. As a university chemistry professor at MIT, she found these similar problems to be following her no matter where she was. She began her talk by introducing the three main questions that she wanted to answer for herself and her future students. First, how can I inspire students to learn chemistry? Secondly, how can I help students see themselves as future chemists? And thirdly, how can I evolve the lecture format to meet these goals? In order to answer these questions, Drennan decided to look at the benefits and drawbacks from the lecture style in the classroom. She found that there are a couple of advantages to lecturing; however, she also found multiple disadvantages to it as well. The benefits of lecturing are the practical nature of the way it communicates the material to a large group of people. Lecturing also is able to label a professor and if they are good or not. This will allow students to find the best teacher by what they have heard about their lecturing style. The disadvantages, Drennan found, may outweigh the advantages. Lecturing is a passive means of conveying material and therefore it is hard to intellectually engage students. The lecturer may not know if the students are getting it, and students are unsure if they are the only one who is confused. Another disadvantage is that one lecture does not fit all, For many students, it is important to see the relevance of the material to the topics they care about. Finally, Drennan has found that lecturing makes that lecturer the prototype for that scholar in that field. This discourages students from feeling like they could be anything they wanted if they do not fit the mold of their lecturer. 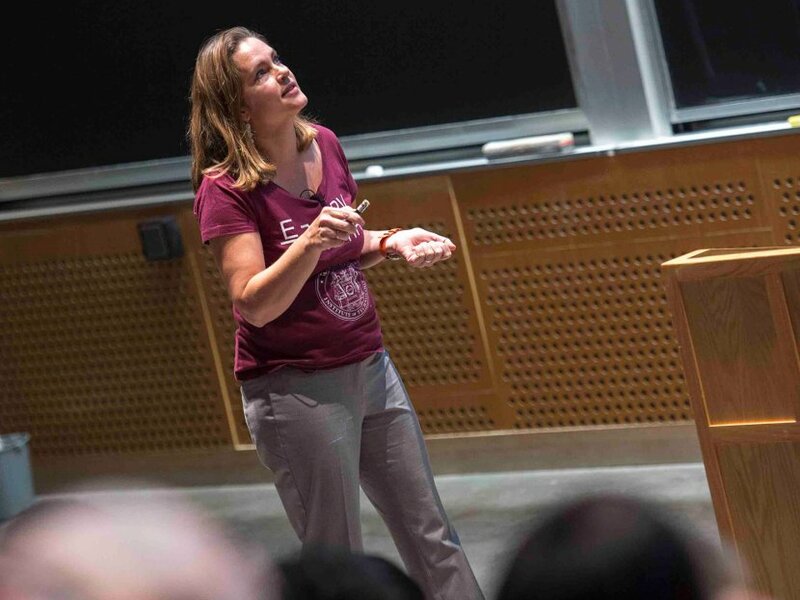 In order to find answers to her questions regarding the learning styles of students, she created a multi-year study of a freshmen chemistry lecture at MIT. Through a series of what she referred to as “selective pressures,” she manipulated the classroom in order to find which groups of students responded best towards her teaching styles. One of these pressures involved using clickers in the classroom with the goal to engage the students and build a sense of community between the classmates. Drennan split up the class into teams and whoever got the most questions right at the end of the semester received a t-shirt. Her results concluded that from the beginning of the semester, thinking conceptually with competition increased from 36% to 82%. Students also found that they were able to identify their weaknesses much easier by the end of the semester with clickers than at the beginning of the semester. Drennan’s final results concluded that the lecture style still works however, it could be updated and improved with minor changes. Drennan believes that “doing small things makes a huge difference.” While she did not need to completely change her classroom settings, little encouragements such as the clickers or increasing in-class examples helped her realize that the typical teaching styles are not bad or ruined but can be upgraded. Sophomore Isabel Paris is a layout assistant. Her email is iparis@fandm.edu.